Early humans did not so much craft hammerstones as they did select them for size, strength, and weight. These massive tools were used to create other tools, such as choppers, which was accomplished by whacking hammer stones against other stones, to chip off flakes of material. Later developments in the Acheulean era saw early humans choose specific types of stone from which to make other tools. Stones like flint, and other "flaking" stones like quartz, could produce a sharp, cutting edge after being struck by hammerstones. Similarly, over time humans learned that hammerstones of different sizes and hardness yielded better results for making other primitive tools. Choppers are roughly spherical stone tools with one sharp edge, which humans fashioned by knocking out a few large flakes. They are some of the earliest stone tools and date back to the Oldowan technological period, which lasted from approximately 2.5 million to 1.2 million years ago. Humans used choppers for cutting up plants as well as for killing, skinning and cutting up animals. Researchers consider the chopper one of early humanity's most important tools along with the Acheulean handaxe. They also represent a marked increase in human cognition during the period. Hand axes were similar to choppers, with one sharp side, but were much larger. They typically had a pear or teardrop shape. Workers created their sharp sides (blades) by removing several small flakes, as opposed to a few large ones, though there is significant variation among specimens in terms of shape, make, and quality. Hand axes began showing up during the Acheulean technological period, which lasted from about 1.6 million to 200,000 years ago. Humans used them for cutting up plants and sturdy tree matter, butchering animals and digging into soil. Humans later began employing the Levallois technique, a kind of template dictating pre-determined chips to be cut from a suitable rock, a process that increased the efficiency of future tools. Scrapers and blades are stone tools from the Acheulean period. Instead of manufacturing them from a core piece of stone, early humans fashioned them from the smaller, flatter flakes that resulted from creating hand axes. Scrapers had long, slightly curved cutting edges, which humans used for scraping animal skins and innards, as well as for processing plant matter. 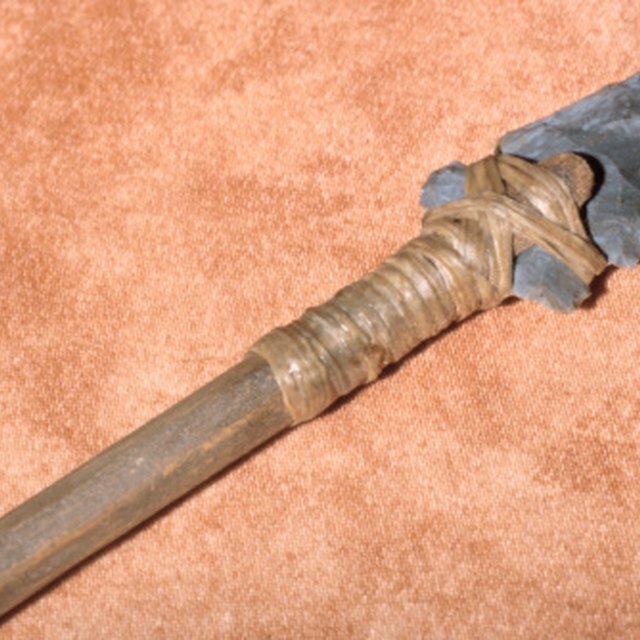 Stone blades, which showed up later archeologically, are modified or improved scrapers that were longer and more slender, allowing humans to fasten them to handles. These primitive knives were used for butchering animals and cutting through trees and other materials, but they also became some of the earliest weapons. Although the materials and construction methods used for modern knives have changed drastically, this basic blade-on-handle design has not. Devaney, Erik. "List of Tools & Weapons From Stone." Sciencing, https://sciencing.com/list-tools-weapons-stone-6882649.html. 25 April 2018.